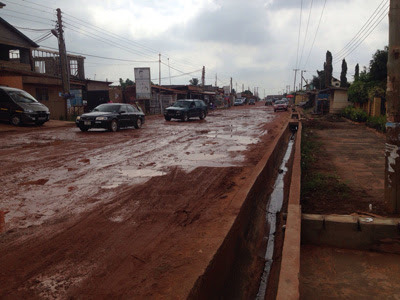 Residents of Okpoi Gonno at Spintex Road in Accra have blamed government over the deplorable state of roads in the community. According to the residents, the roads have not seen any development over the past two decades. This they said is creating nuisance to pedestrians, motorists and other road users in the community. “We constantly have to change shock absorbers and other parts of our cars due to the deplorable state of the road,” a resident who spoke to DAILY GUIDE on anonymity said. He added that every year the situation worsens when the rainy season starts and this year, it was terrible. When DAILY GUIDE visited the community over the weekend, major parts of the road had been damaged due to the recent downpour. However, some concerned residents were seen filling the giant potholes on the road with stones and debris to make it motorable. “We have on countless occasions complained to the Ledzokuku Krowor Municipal Assembly (LEKMA) but all they have been telling us over the years was that they have awarded the project to a contractor yet we do not see any development,” another resident said. When this reporter caught up with some Taxi drivers in the community, they could not control their anger, stating that sometimes they are forced not to use the road because it ends up damaging their vehicles. They have therefore appealed to the government to help fix the road and make it motorable .